The most complete catalogs on the market. · Leveling Implement "Locks into position to guarantee leveling takes place"
· Built Like a Tank! Our Pro Groomer PR72 Demo Video. We believe you will find our demo video to be informative and detailed. 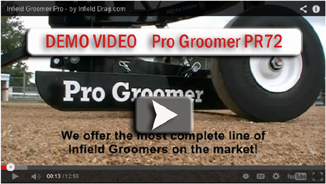 Compare our video to our competitors and discover that our video shows clearly how the Pro Groomer works and what it will do for your infields. We don't hide the details. link is at the top of this page. Standard Equipment on the Pro Groomer PR72? Adjustable Tongue and Hitch Combo. Heavy duty 2" x 2" thick wall steel Welded Frame. No-Air, No-Flat Wheels (never need air). 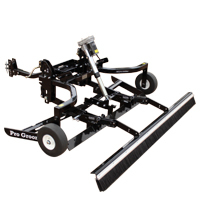 LevelFlo2 Leveling welded 2-bladed Implement with exclusive "level lock" height and leveling adjustment system and Rear Smoothing Broom. So to order you first choose a Model Number (example PR72-WR) then you choose any optional accessories / attachments to add. Below are the different model numbers (with "Factory Direct" pricing). Switch Box Operator Lift System. and the "PW" Portable Wireless Remote Control Operator Lift System. Remote Control Operator Lift System. Each PR72 Model Number shown includes the same standard parts but each has a different "operator lift control system". (MN, HW, SB, PW, WR). All have the same standard equipment/parts. See catalog (top of page) for more details. MN = Manual Lift. Includes our exclusive "Posi-Lock" Lift and Lock Technology. HW = Hard Wired Control System. Wired direct into your tow machine. Dash Mounted Rocker Switch and Complete Wiring Pkg. SB = Corded Switch Box System. Uses 12V battery of your tow machine. Has hand held switch control (and 2 Extension Wires). PW = Portable Wireless Remote Control. NEW 2019 Uses 12V battery of your tow machine. WR System at lower cost! WR = Wireless Remote Control. 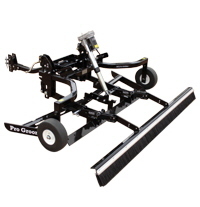 Complete 12V System on-board groomer with Charger, Monitor, Wireless Remote System & more. Drag Mat Brackets Only (Customers who want our Brackets and use their own drag mat. Includes hardware to attach brackets to Rear Broom). It will bypass the "WR" or "HW" system and use the battery of whatever 12 volt tow machine you choose to operate the electric lift. It can be kept in storage until as a backup. If you simply have to groom no matter what then consider this backup control system. HW" Electric Lift Conversion Package (Convert a manual lift machine to "HW" HardWired Electric Lift). This optional accessory is for customers who previously purchased a "Manual Lift" machine and now want to convert it to "Electric Lift". This option then requires removing the manual lift parts from a groomer and installing this complete "HW" Electric Lift System. "SB" Electric Lift Package (Convert a manual lift machine to "SB" Corded SwitchBox Electric Lift). This option then requires removing the manual lift parts from a groomer and installing this complete "SB" Electric Lift System. tow machine battery. Requires removing the manual lift parts from groomer and installing the complete "PW" electric lift system. "WR" Electric Lift Package (Convert a manual lift machine to "WR" Wireless Remote Control Electric Lift). This option then requires removing the manual lift parts from a groomer and installing this complete "WR" Electric Lift System. See Catalog for Details about all Operator Lift Control Systems. 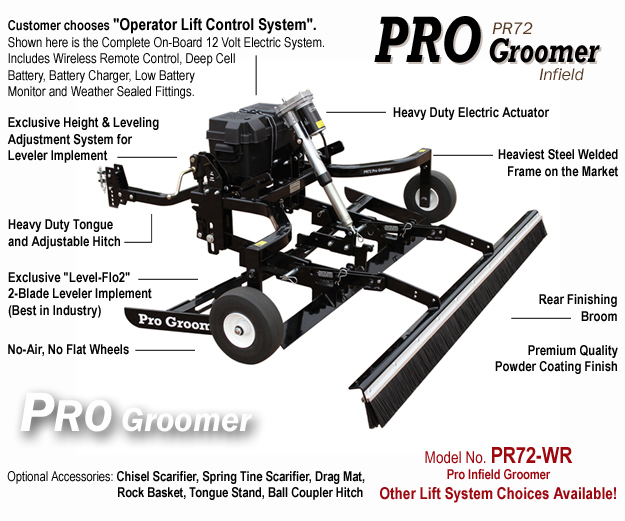 Pro Groomer PR72 - Your Own Personal Grounds Crew built into One Ultimate Machine! No question - the Best Infield Groomer on the Market! and in safe playing condition. Maintains - Restores - Renovates Infields Quickly & Easily. Levels, Smoothens, Mixes, and Breaks up Hard Infields. Yes, it will level your infields and keep them level! We Guarantee It. Reduces sliding injuries, prevents water puddling, and controls weeds. Available with 4 choices of "operator lift control systems" (manual & electric). Easily adjusts to different towing machines. No need for hydraulics or 3 pt. hitch. finish to the grooming process. Numerous optional attachments available. Don't miss our Complete Catalog (link at the top of page). Optional Scarifiers to Pulverize - Shatter - and Break up Hard Infields. have these hard infields we offer two scarifier choices. Easy to use. Saves Labor. be attached behind the Chisel Scarifier during it's use to help break up chunks and smoothen the surface. PRST-6800 VibraTine Spring Tine Scarifier (For Electric Lift Machines Only. Special Order). Shatters and pulverizes only the top portion of infields. Completely adjustable to different angles. Two rows of staggered spring tines. Mounts to front of groomer. Can be used while grooming. If you want to be able to deep till then consider the chisel scarifier. Attaches to front of the Pro Groomer (ahead of the Leveler Implement). Warning: The Spring Tine Scarifier adds significant weight to the front of the groomer. When lifting on the tongue to connect the groomer to a tow machine you are lifting more weight. This is especially difficult when it is combined with the "WR" electric lift system that has a 12 volt battery on board. A chisel scarifier on rear of machine does help counter weight the spring tine scarifier. Note: Customers with extremely hard infields (especially infields with sand mixtures) should order the Chisel Scarifier which is more effective on hard infields. 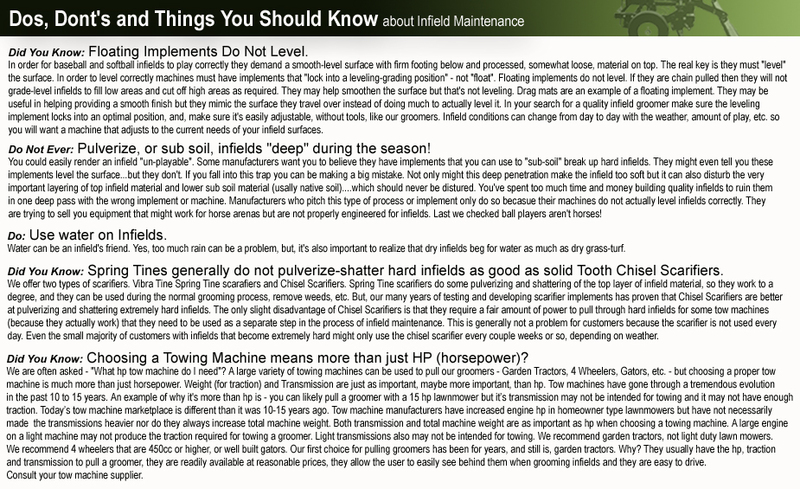 Things you should know about Breaking up Hard Infields. they are simply misleading customers in order to sell equipment. NEVER disturb or damage your infield layers. of grass, and other debris over time. Easily attaches and removes from rear of leveler (without tools) to empty when needed. ALDM-7236 72" wide x 36" deep Drag Mat is the same width as the Rear Finishing Broom. ALDM-7836 78" wide x 36" deep Drag Mat is 6 inches wider than the Rear Finishing Broom. How do I decide which size drag mat to order? Remember: both sizes are adjustable left to right in 1" increments behind the groomer if desired. 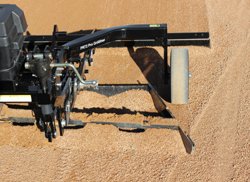 72" wide drag mat is usually preferred by customers who will groom their base paths on baseball infields. that the dirt path be approx. 80" wide (with the 72" Drag Mat). This allows 3" clearance on each side for driving. overlaps the rear finishing by 3" on each end - or it can be adjusted side to side (in 1" increments) to your preferred position. When you order an optional Drag Mat it includes our exclusive Drag Mat Carrier Brackets. behind the groomer at all times (no need to hand carry the drag mat). when needed, so it's very versatile. mats have a support tube mounted to the front of the drag mat that adds support while it rides in the brackets and while it's being pulled during use. What is the advantage to having the optional Drag Mat attachment? creates chunks which the drag mat helps break up. It can also be used every day during normal grooming but the benefits may be negligible. 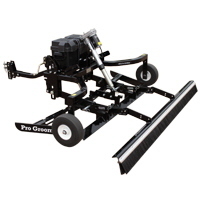 PRGB-7200 High Speed Grading Bar for Pro Groomer PR72 (LevelFlo1). Customers who need to groom infields "very quickly" between games should consider this optional attachment. short. 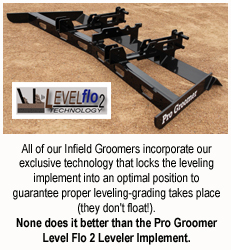 They would groom all of their infields before the day's play with the normal 2 bladed Leveler for perfect leveling. were done they groomed the infields with the 2 blade Leveler Implement to bring them back to perfectly level. High Speed Grading Bar for final finishing. Easily connects to the end of the tongue the same way the standard pin hitch does. Choose either 1-7/8" or 2" Coupler. PATS-2000 Tongue Stand Option. Connects behind the hitch, on tongue. When the groomer is unhooked from the tow machine the stand keeps the end of the tongue off of the ground. When the Pro Groomer is hooked to the towing machine, the tongue folds out of the way. When stored inside, on concrete, the caster wheel allows for easy movement around the storage area. Older machines require drilling one hole in the tongue. AL-E-006/098 Additional Wireless Transmitters available for our "WR" and "PW" Electric Lift Systems. Transmitters include Lanyard. We also provide easy instructions on how to "Learn", or "Pair" a transmitter to a receiver. Also consider the "SB" Backup operating system as an option. The "SB" is a portable control system. ALWP-1212 Additional "HW" Tow Machine Wiring Package. wish to wire an additional tow machine that will also be able to operate the groomer. ALSB-1212 Backup "SB" SwitchBox Control System. This is a "portable control system" that can be used as a "backup" if something goes wrong with a "WR" or "HW" operator lift system. entire electric system of a "WR" or "HW" except for the electric cylinder (actuator).